As marketers, we all want to generate more traffic for our eCommerce site, and we want that traffic to convert into sales at a high rate. Every business has a unique target audience that varies on hundreds of metrics. Changes to your store should be designed to help your target audience move through the buying process quickly and easily. A site that makes it easy to buy for its particular customer audience will sell more. In this post, we’ll share how simple changes to your Magento site can have a dramatic effect on Revenue Per Visitor (RPV). In a short case study, we’ll provide an example test from one of our clients participating in the Mobile Optimization Initiative (MOI). We’ll show how a small, targeted change to their site increased mobile sales 14%. Finally, we’ll demonstrate how testing has helped us better understand our target audience. Our client, we’ll call them ‘CarCo’, owns a site that sells clothing and accessories for Corvettes. Today, there are roughly 750,000 Corvettes in the United States alone. The ‘average’ owner can be classified as having some college education, an income over $100,000 a year, is in his 50s, is into motorsports and is passionate about customizing and showing their Corvette at car shows. They also spend heavily on their vehicle and quickly—with some 47% having customized their car within 3 weeks of purchase. In fact, within a year of purchase, 46% of owners spend $1,000-$5,000 customizing their car. 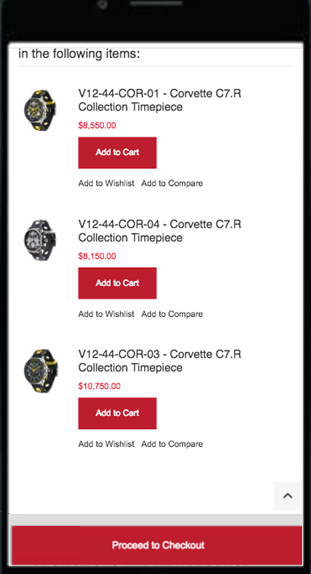 Like many Magento merchants, CarCo is interested in improving their mobile conversions. After we introduced them to the MOI, CarCo was eager to jump on board. As part of CarCo’s participation in the MOI, a test was created that placed a ‘Checkout’ floater button bottom at the bottom of phone screens. It displays when the customer is in the basket (see the screenshot to the right). This floater stays at the bottom of the screen as the customer browses their shopping basket. Our theory was that the visible Checkout button on the bottom makes it very easy for customers to move into the checkout process. This test was tried on 10 sites. As you can see in the histogram below, the test failed on most sites. That’s not unusual. Often, even good ideas don’t work for a variety of reasons. That’s why we test. Better to have a test fail than to implement a change that hurts sales. However, when the same test was implemented on CarCo’s site, it actually resulted in a positive RPV lift. Spectacularly so, as it increased the revenue per visit by over 14%! Obviously, the test is a winner and the test should be implemented permanently. But that begs the question—why did it work for CarCo and not the other sites? Let’s circle back to what we know about our target audience. They are a bit older. They are heavily focused on their cars, spending lots of time and money on them. They probably aren’t spending a lot of time on tech toys. They’re also likely very busy with demanding jobs. So our theory is that this audience is less tech-savvy, and less patient. So changes to the site that make it easier and faster to checkout improve the customer experience and increases RPV. Note that we’ve learned something new about the target audience. While we knew the demographic information we’ve listed above, we now have conclusive test data about their behavior. We believe that they are both time sensitive and probably less tech savvy. So what’s next? Further changes and testing will now focus on changes that simplify the customer experience and make fewer choices necessary. For example, reducing the number of navigation options in the checkout process. We’ve seen from CarCo, and other participants in the MOI, that there are major sales gains to be had by optimizing the site. Customer audiences are complex and changing. It’s easy to guess at what will work on your Magento site. However, often best practices are proven ineffective for unique customer audiences. So continued learning about your customers, and testing, will identify the changes that will help you sell more. You may be able to join the Mobile Optimization Initiative. If you do, you too will probably learn more about your customers, test some site changes and sell more! Brad Kort is President of Web 2 Market, which he founded 21 years ago in a spare bedroom. His goal was to help small and medium-sized businesses use the web strategically. He can be frequently found at the bottom of Lake Michigan in his scuba gear and welcomes anyone who would like to join him there. Web 2 Market now provides data-driven Magento digital marketing, custom development and hosting. Being data-driven means using the vast array of analytics data and tools from vendors like HiConversion. The proper use of these tools can provide deep insights into your clients, how to generate more traffic and how to convert that traffic into sales. Our goal is to help your business sell more and manage better. Web 2 Market’s offices are in Chicago and Kochi. Connect on Twitter, LinkedIn, and Facebook.